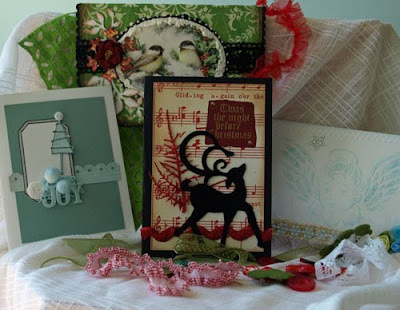 The Girls at the "Let's get Shabby" challenge blogspot have put together a couple of Christmas cards Raks AND all you have to do is leave a comment about your favorite Christmas memory, EASY HUH!!! I wish I could play some of my Fav artist hav made cards 4 these raks!!! I have thought about my favorite Christmas memory & I hav so many... when I was a kid, when my kids were little, but if I have to pick just one it would be when our Family would go to my Daughter Jamie's house for dinner & open gifts Just being together has to be my Favorite Memory!!! Go 2 the SHABBY site & let's hear your Favorite Christmas Memory & you might win this awesome Rak, Plus there is one more rak with a different set of cards. Beautiful cards! I didn't leave a comment, but I did sign up to follow the Shabby blog. Yes what a beautiful cards we made! !